One of the most frequent questions I get asked is what is a good fountain pen for beginners. Being a fountain pen novice myself I have tried out several and always come back to one that I always recommend: the Platinum Preppy. The reason I like the Preppy so much is that the nib writes very well for such a low cost pen. I of course prefer the Fine nib, but there is a Medium option if you prefer. When you first snap in the ink cartridge it takes a minute or two of scribbling to get the ink flow going, but once you do it is a solid, steady, and smooth performer. I keep this pen within reach at all times for when I want a no nonsense fountain pen experience. 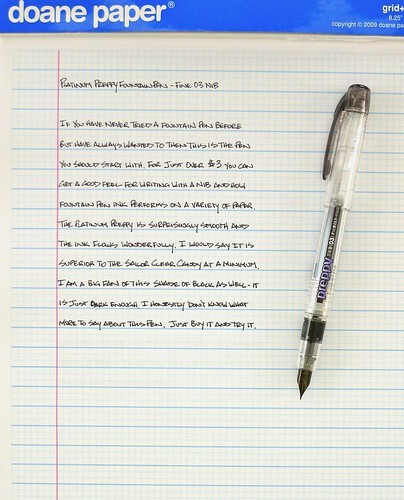 Posted on April 11, 2012 by Brad Dowdy and filed under Fountain Pens, Pen Reviews, Platinum, Preppy.